Climbing the Torre degli Asinelli or Asinelli Tower is an experience every visitor to Bologna seems to want. The tower has stood in the heart of the city for nine centuries, and with its neighbour, the Garisenda Tower, it is a symbol of Bologna. Together, they are known as le Due Torri, the Two Towers. 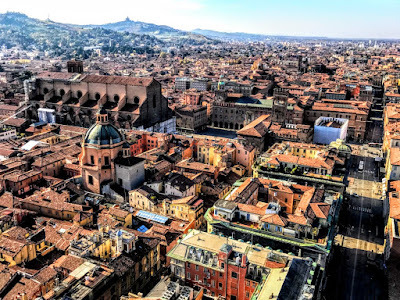 In the Middle Ages, it is said, Bologna had up to 180 towers. However, more recent estimates put the total number between 80 and 100, and not all towers existed at the same time. They were built both for both prestige and defensive protection. However, as the centuries passed, earthquakes, fires and lightning and town planners lacking vision brought down many of these towers. The last demolitions of Bologna’s towers were carried out in the 20th century, when the Artenisi Tower and the Riccadonna Tower were demolished in 1917. Fewer than 20 towers can still be seen today. The Asinelli Tower stands at the Piazza di Porta Ravegnana – the junction of the streets that lead to the five gates of the old city wall. It is 97.2 metres high and the tallest tower still standing in Bologna. The Asinelli Tower is said to be named after the family that built it in 1109-1119. However, the name of the Asinelli family is documented for the first time only in 1185, at the time of an attempted arson attack, almost 70 years after the family was said to have built the tower. The Asinelli Tower was originally only 70 metres tall, but it was later raised so it could be used to send luminous warning signals that could be seen in the far distance. In the 14th century, the Asinelli Tower came into the ownership of the city, and it was used as a prison and a stronghold. During this period a wooden footbridge was built with scaffolding 30 metres above ground, linking the tower with the neighbouring Garisenda Tower. The Garisenda Tower is leaning visibly, but the Asinelli Tower is a leaning tower too – it leans by 2.23 meters (1.3°). Giovanni Visconti, Duke of Milan, wanted to use the towers to suppress possible revolts and to control the turbulent Mercato di Mezzo – today’s Via Rizzoli. The Visconti family had become the rulers of Bologna after the decline of the Signoria of the Pepoli family, but were unpopular in the city. The wooden bridge was destroyed in a fire in 1398. Later, the Asinelli Tower was used by the scientists Giovanni Battista Riccioli in 1640 and Giovanni Battista Guglielmini in the 18th century for experiments to study the motion of heavy bodies and the rotation of the earth. Severe damage was caused by lightning that often resulted in small fires and collapses. But the tower survived, and a lightning rod was installed eventually in 1824. During World War II, the Asinelli Tower was used as a lookout in 1943-1945, with four volunteers on top of the tower directing rescue operations to fires during air raids. In the 1960s, the architect Minoru Yamasaki was inspired by the Two Towers as he designed the World Trade Center in New York. The neighbouring Garisenda Tower stands at 48 metres. Initially, it was about 60 metres high, but it had to be lowered in the 14th century because the ground below was subsiding and the tower was slanting and dangerous. 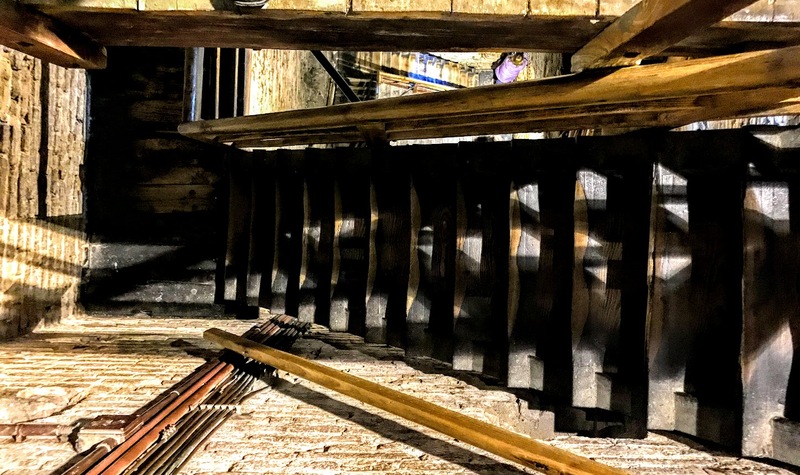 The Asinelli Tower recently re-opened after a three-month restoration that focused on strengthening the internal wooden staircases leading to the top and at restyling the rooftop terrace. 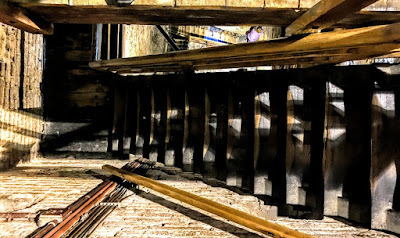 To reach the top of the tower, I climbed the 498 steps of its steep wooden staircases one morning last week. For those who tire easily, there are platforms at regular intervals. 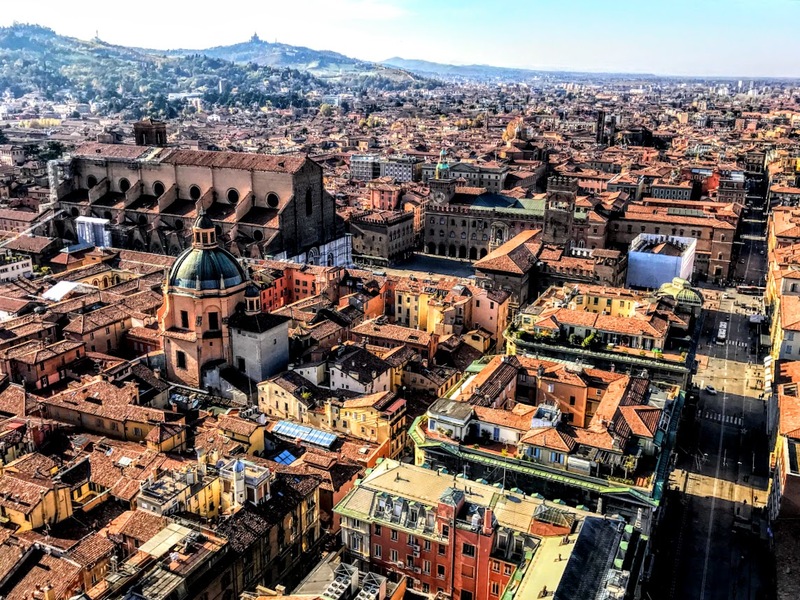 The reward at the top is a panoramic view of Bologna spreading out below, with the Piazza Maggiore and the city’s red roofs, towers, churches, domes, palaces, squares, parks, belfries and the univerfsity. To the south are green rolling hills that frame it to the south.